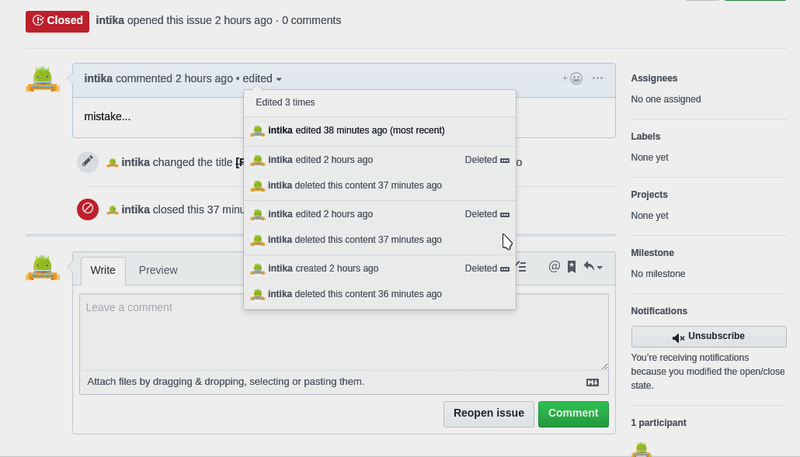 Is it possible to completely remove an issue from the GitHub issue tracker? Update Nov 2018: You now can delete your issues! See "Github - remove issues entered in error"
Three 8 years later, and closing issues remains the answer (still no deletion possible). No, the github API only allows you to open/close/reopen issues. Here's the Issues API docs. You can edit an existing issue (let's say if it's a duplicate) and you can change the title, description and target milestone to be something completely different. That's as close as you can get to removing the ticket, AFIK. For posterity: Deleting issues would be a bad thing, since in general they can be targets of associations on github. Copy your issues via the Issues API. Delete the original repo; alternatively, chose a new name for your new repo. Re-create a new repo based on your clone. Re-create the issues you want to keep via the Issues API. I imagine this could potentially lose a lot of other linking information as well such as forks, pull requests, etc. Thanks for the suggestion. It's only possible to edit/clear the issue content currently. However I've added a +1 to this suggestion on our internal Feature Request List. confirming it was not possible. set the title to something that will never conflict with any search, e.g. a single dot .. This may not hide the history of your blunder entirely because of the automatic undeletable "changed the title to" comments. If something is a security issue, contact GitHub staff, they usually reply quickly, and are able to remove issues for good as can be seen at: http://archive.is/OfjVt which has issue 1 and 3 but no 2. You can delete the entire repo if it's really important. Users are unable to do this, including repository owner. 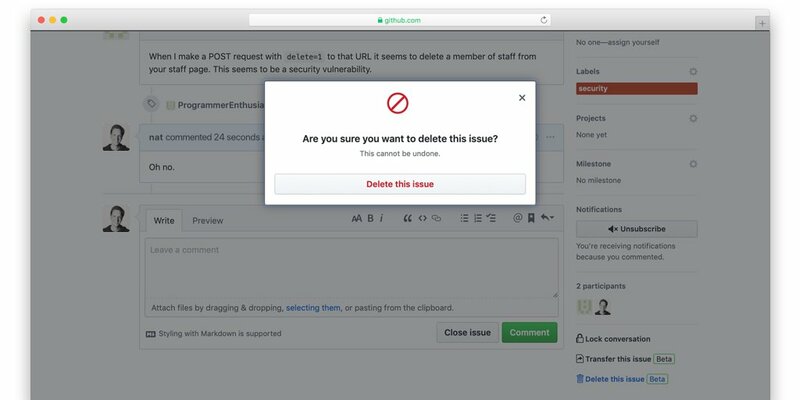 But issues can be deleted by Github support. One may contact them and request deletion. It may be delayed or refused but it is an available option that can be used. Still impossible. Another workaround to the ones suggested in the other answers is to label the issue as "deleted" (or any other label you might fancy better), to be able to filter them out if you use the github API to retrieve them. Obviously you should use that specific label only for this purpose, setting the label when you close the issue. As of 04/2019 not all issues can be deleted current work around is to edit the issue then delete the edit history, the only downside is that the issue still exist and the old title could be seen. Not the answer you're looking for? Browse other questions tagged github privacy issue-tracking or ask your own question. Git - Is it possible to modify/delete the reflog of a remote git repository, e.g. on Github? Is linking to a GitHub issue reliable?